We are representatives for Rupp Air Management Systems. If you would like to get a quote on a Make Up Air Unit, just send us the specs! Since 1965, Rupp Air Management Systems has designed and manufactured direct-fired,	gas heaters for commercial and industrial applications. From make-up air to supplying	the total heat system large or small, RAMS has the solution to meet your needs. Over	the years, we have continuously improved our product line meeting customers ever	increasing product and service needs by offering equipment that is Built Right	First…..to Last. Rupp Air Management Systems is dedicated to producing the right direct-fired system	designed and engineered with the smallest of details in mind to give unmatched	performance. Our continued commitment to quality and mechanical reliability means	that each system has to be hassle free to install, and will supply fresh, clean,	tempered air to any indoor environment. 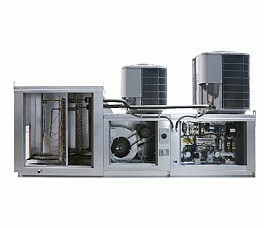 Rupp Air Management Systems economically replace exhausted air, or heat the space	with a minimum introduction of fresh air. RAMS make-up air systems eliminate drafts,	contaminated and stale air and temperature stratification, and create positive	building pressure – necessary for good indoor-air quality – while maintaining	comfort levels. Rupp Air Management Systems offer 100% fuel efficiency. Each RAMS unit has a turndown	ratio of 30:1 capability, delivering replacement air at a constant temperature	regardless of outside temperatures. The Result….year round, cost effective comfort. Rupp Air Management Systems other products have also been designed with the customer	in mind. From exhaust fans and air-turnover units, to heating and ventilation,	equipment designed to meet your needs. Each piece of equipment undergoes a	complete and stringent series of tests to ensure that the unit is durable	and works reliably for years to come. At Rupp Air Management Systems, our	commitment to continuous innovation in the make-up air and ventilation industry means you can count on us to deliver the best system available.